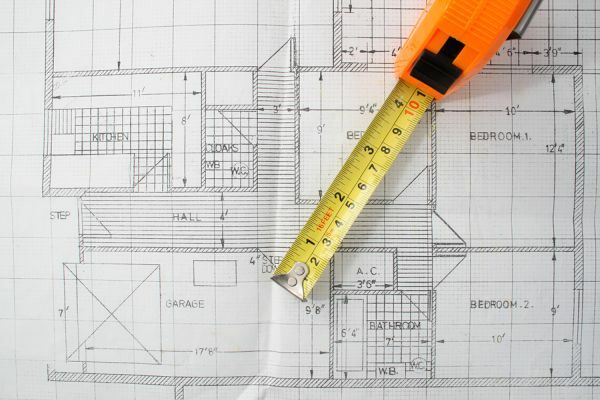 Calculating the square footage of a home is not as easy as it sounds. Square footage is calculated by measuring the outside perimeter and individual room spaces. The most common way a homeowner can determine size is by hiring an appraiser (generally the case when buying or selling, but can be done outside of that as well!). The easier and less expensive way (without measuring) is by pulling up tax assessment records. Square footage must be living space of a home. Items not included and given a separate calculation are garage spaces (whether attached or detached), attics, lofts, detached buildings, and additions without building permits. It’s important to note that certain rooms and levels may also be adjusted differently when determining the value/price per square foot. Basements or lower levels (with at least one wall below grade) aren’t valued as high as upstairs living space. For example, if the square footage of a home is 2000 and valued at $50/square foot, a basement with 300 square feet may be valued at $35/square foot. Another space generally valued slightly lower than traditional living space is floor plans containing a room over the garage – if it has a separate staircase and no hallway connecting to the rest of the upstairs living space. A home with 2 separate staircases doesn’t necessarily mean it fits in that category – only if the room does not flow through the rest of the upstairs. Square footage calculations are generally subjective. Two people measuring a home are likely to come out with slightly different outcomes. Houses are rarely perfectly square, making it that much harder to be completely accurate. For this reason, marketing real estate will always specify the approximate square footage. Hampton Roads Real-e-statement is written by Alyssa Godwin, a Realtor with Liz Moore and Associates. For questions regarding square footage calculations contact Alyssa at 757-329-6161 or alyssagodwin@lizmoore.com. You can also find Alyssa on Facebook or on the web at www.lizmoore.com/alyssagodwin.